In 2017 the national average was $10.54 cents per kilowatt hour. Ohio is below the national average at $9.71 cent/kWh. Ohioans have been enjoying a decline of that number over the past few years and there’s a reason for that according to GEI Senior Director for Policy Heath Knakmuhs. “Not surprisingly, of the eight states that experienced a decline in their electricity rates from 2016 to 2017, half of those states are either awash with shale gas (Pennsylvania and Ohio), or directly border them (Delaware and Maryland),” Knakmuhs said in an article for the U.S. Chamber of Commerce. With fracking producing large amounts of natural gas from shall, gas prices are falling in the region. That means production is cheaper for power companies using gas-fired plants to create electricity. 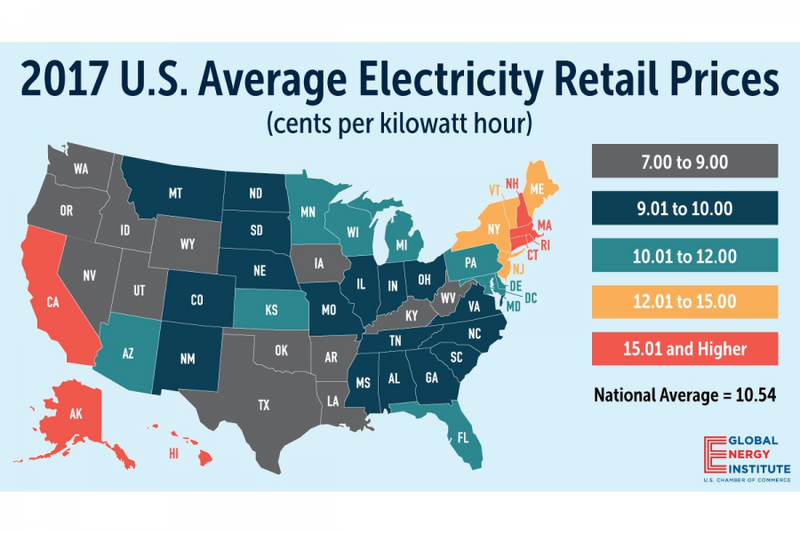 The highest average price in the country according to the report is in Connecticut at $17.62 cent/kWh. The lowest in the US is Louisiana at $7.75. According to the report prices are expected to drop over the next year.